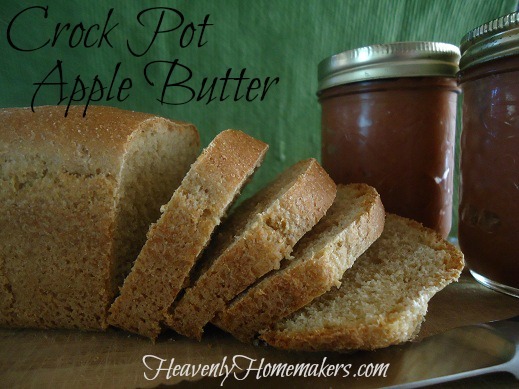 Many of you offered suggestions as to how to make Apple Butter – thank you! My house smelled wonderful for hours, thanks to all of you! I decided to experiment with my friend Leesa’s apple butter method, and found it to be very simple and delicious. I only made a small amount this time, since I was experimenting – so you’ll want to double or triple this recipe if you want a larger amount. When I started with one quart of applesauce, I ended up with two and a half – half pints of apple butter. However, it is very clear to me that writing half – half just looks weird and confusing. It may make more sense for me to say that one quart of applesauce resulted in 2.5 half-pint jars. Or we could say that I ended up with one full pint plus a half of a half pint of apple butter. This is, of course, the same as two and a half cups of apple butter, which is otherwise known as five half cup portions of apple butter, better known as ten – 1/4 cup portions, which we all know is precisely 20 – half of a half of a half of a half of a half pints of apple butter. Give or take a half of a half of a pint. Stir ingredients into a crock pot. Cook on low for about six hours on low setting, with LID OFF, stirring occasionally. Store the apple butter in the refrigerator - or process in a hot water bath for 10 minutes to seal. If the jars are sealed properly, you can store your apple butter in the pantry until you're ready to serve. Find my Homemade Apple Sauce recipe here. Read information on how to process in a hot water bath for 10 minutes to seal your jars here. Caution: Contents cooking in crock pot are hot. Refrain from sticking a finger into the crock pot for a lick, even though the delicious smell will create a major temptation. Dipping in with a teaspoon is obviously a much better option. No double dipping allowed. In addition, be aware that partaking in too many licks from the crock pot will result in a smaller amount of finished product, which will mean that all of the math I labored over above, rounding carefully to the nearest half of a half pint, will be null and void. Well, the result of my experiment was only so-so. It’s not blog worthy. :) I’ll have to keep trying! I used cream instead of evap milk and cream cheese instead of cream of cheddar soup. Butter instead of margarine of course! I also added some garlic powder and sea salt for flavor. It was pretty bland and very dry. I THINK if I would have only cooked if for two hours it may have been better. Who knows! Mix macaroni and grated cheese together. Add evaporated and whole milk, salt, pepper, margarine and eggs. Pour into lightly greased crock pot. Top with sliced cheese. Cover with lid and cook on low (no peeking) for 3 hours. I usually start this at home and finish it at the church. That way it’s hot at mealtime. Great post.. laughed out loud!! I have just 1 and half (or three halfs?) 20 pound boxees left! and 28 cans of applesauce, and a bag of dehydrated apples (yum!). Thinking maybe I could core my apples, throw them in the crockpot to make the applesauce part, immersion (or processor) blend, then continue cooking in the crockpot to make it to the butter part…? Think that would work just fine? I’m glad you found a simpler way to do the applesauce with skins on and the food processor. I’m all for simplicity! I don’t add sugar to my applesauce, but have been wondering if I added honey or something, my applesauce might be Christmas gift worthy with other treats. I don’t know if “normal” people will think my sugar free version is sweet enough the way it is, like I do. Maybe that would make it like super amazing applesauce? I don’t know. If I were giving it to others, I’d probably add a little bit of brown sugar to make it more the way they’re used to. That sounds yummy. I just canned some pear sauce that I will have to try this on at some point. I wonder if you could freeze this. I have some freezer jars empty and waiting for something, but I don’t have any canning jars. Yes. I froze mine last year. I have successfully frozen this…it works great! I made apple butter for the first time this year. I peel and core my apples on my handy dandy little gadget then just throw them into the crock pot, I’m not really careful to make sure ALL the peel is off, extra nutrients. I don’t add anything for the first few hours, just let them cook down. Once they have turned to mush I add some cinnamon, cinnamon oil, clove(very little), cardamon, and fresh ground nutmeg. I turn it to low and let it cook for a few hours. I didn’t add any sweetener to this last batch, the apples seemed sweet enough. 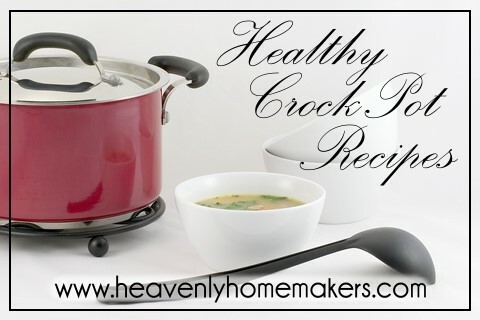 I take the lid off the crock pot, turn it back on to high and stir it every 30 minutes until it is the right texture. I have never even used my immersion blender in it. It seems to cook right down and is fine. I’m headed out to get two more bushes of apples this weekend to make some more. planning on giving out apple butter to all my neighbors this Christmas. Laura, where is the like button? You are hilarious! Yum! Will it work in a crockpot that is way too big for the amount of applesauce? As in, will the apple butter burn if I only have a small amount in the bottom? My crockpot is 6 qt., but I don’t exactly need that much apple butter! Will using just a quart in that size be okay? Thanks! Yes, I did this in my big crock pot and it did just fine (I have a 5 quart I think). I purchase a tiny slow-cooker for these kinds of projects and love it. It’s great to take in the car too. It cost me about $10 at the grocery store – well worth it. Just a note on the recipe – I never do more than 3 quarts of applesauce at a time because it takes to long to cook down in the crockpot. BTW I started doing this because I burned WAY too many pots of apple butter. I would say that any butter would work this way but you should NEVER can pumpkins in a pureed form so pumpkin butter cannot be canned SAFELY! Thanks – I’ll go edit the post to say something about using no more than 3 quarts. Thanks for this idea, it’s very tasty! Pumpkin butter will can safely in a pressure canner. I’ve never heard this … have seen plenty of canned pumpkin butter, but I guess freezing is safer after all. Thanks for the info! Is it really THAT easy? awesome. You are so funny girl!! Homemade brown sugar? How do you make that?? Okay, so going through my head now is a half of a half of a half of a half…etc! Only you could get away with that. Or, Maybe, Erma Bombeck… I love your humor. thanks for the crock pot recipe…. Haha I wish I could meet you you are hilarious! We have the samsame kind of humor lol :)thanks for your great posts! Hey moneysavingmom.com just made apple butter…I think without slaving over applesauce first. Maybe worth it to check it out it may be easier im not sure..anyways enough rambling!!!! When I do apples, I through the apples directly into the crockpot and let them cook all day. They are applesauce first, then applebutter after long enough. Oh nice ,good thinking! Im making your yogurt and cream cheese for the first time today! Can’t wait to see how it comes out! Is that your ww bread too in the picture? It looks delicious too! I made apple cranberry butter this year. Just add cranberry juice. So yummy on turkey sandwiches. Wish I had known about the LID OFF part of this when I made some last weekend. I had a crockpot full of very dark applesauce, so had to cook it down on the stove to get to right consistency. After 8 hours, I gave up and canned what I had. Still tasty, but not what I expected. Next time, I will be more successful! Hi there, I just stumbled upon your post because I was trying to find out why my apple butter is taking so long! It has now been in my crockpot for 24 hours – on low with the lid askew over a splatter guard, and has reduced/thickened just ever so slightly… Now I know that I should NOT have FILLED my 6 qt. crock pot to the top with applesauce! I will now crank it to high, take the lid off, and see where I am by the end of the day. BTW… Love the site and your post was too funny! I do not put my applesauce through any strainer. I simply use my grinder. The applesauce ends up sort of chunky and we like it that way. No cooking. Though it does need to be heated up or processed longer because I don’t cook it. Of course, you would probably want to peel the apples doing it this way. I have a very similar recipe from an aunt but even easier (not as healthy though). I buy a #10 can of applesauce from the grocery store (the unhealthy part but just getting into healthy stuff now), then add the spices and cook in the crockpot until the right consistency (about 6-8 hours). Here comes the even easier part. Once you fill the jars and screw on the lids, turn them upside down for 30 minutes. After 30 minutes, turn them upside right again and leave alone for several hours. They will seal themselves without the water bath. My aunts, mom and I have canned apple butter for years this way. The #10 can produces 6 pint jars of apple butter (no halves, sorry).